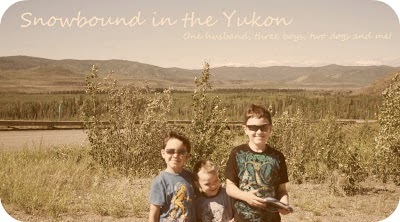 Snowbound in the Yukon: Ramblings. SInce we last spoke there has been a lot of business in my life. First I did my quick trip to the City to drop off Hubby at the airport. I did a round trip in one day, 12 hours on the road well maybe almost 12 hours. Yes, it's a little crazy but I really didn't want to stay in the City, so it was a long, long day but the kids did really great. Kids got to go to McDonald's and got some new toys. They did well. We've been hampered by the rain, it's been raining for 4 days straight. That's all? Man, it seems like so much longer than that. So we haven't been out much, we did go out in the rain to the Kid's Fest at the Music Festival here. The kids had fun. We wandered around the grounds and had some fries. Their cousins came over and then SmartGuy went with them to have his very first sleep over. He was super excited but got a little teary before he left then was fine all night. My brother called me at 11ish to tell me everything was alright and the kids were just going to bed, they must have been jumping another cousin slept over as well. They told me the next day he was up around 12:30 and was scared of the dark and wanted his mom. They told him to go back to bed. Yes, he does the same thing at home. My kids don't get lamps or night lights and they have never been afraid fo the dark because of it. When they slept with me I always have a touch lamp and the light above the store is always on, she there is a bit of light but up here in the Land of the Midnight Sun we don't worry about that in the summer time. Cousins came over the next day and play and played until they got tired of each other and started bickering, so I took them home. So yes, it's been very very quiet in my household. The painters were finally there this morning with there being no rain. My house is clean, except for the playroom which I cleaned completely on Sunday and it's now a disaster again!! Oh well! Still more training needed in the teaching of cleaning department with my guys. The one thing that is really cool is that when we were in the city I bought this think called iRobot Roomba. It's a vacuum cleaner that cleans your floors when you are asleep or away from hom. I finally set it last night to run around half the house, the push of one button and it goes. Unfortunately it's a little bit loud and SmartGuy was still awake and kept coming out, so finally I shut it off and then Hubby called so I had to shut it off again. It got done in about 45 minutes I think, I didn't time it but I'm thinking that's about how long it ran. It did a good job too! It doesn't just stay in one area, it goes around and around and around each room several times and picks up everything. So this morning I emptied it and blocked off the done section and set it to clean the rest of the house. I just make sure everything is off the floor and push the Clean button and away it goes. It's very cool! And it doesn't the job that I hate most of all. I never used to hate sweeping until I had three kids and had to sweep every single day, sometimes twice a day! So this Roomba is a godsend. I hope things are well and mil is doing OK.
My dad didn't make it. He never regained consiousness and we took him off life support two days ago. Now we have to deal with mother! I am very sorry for your loss! I will keep you in my positive thoughts!